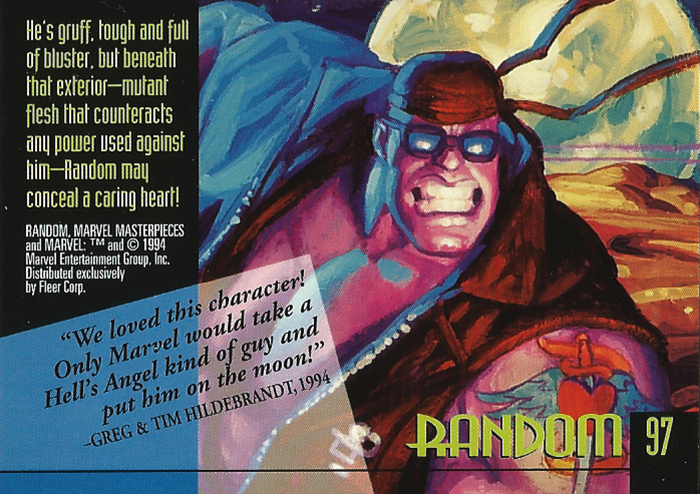 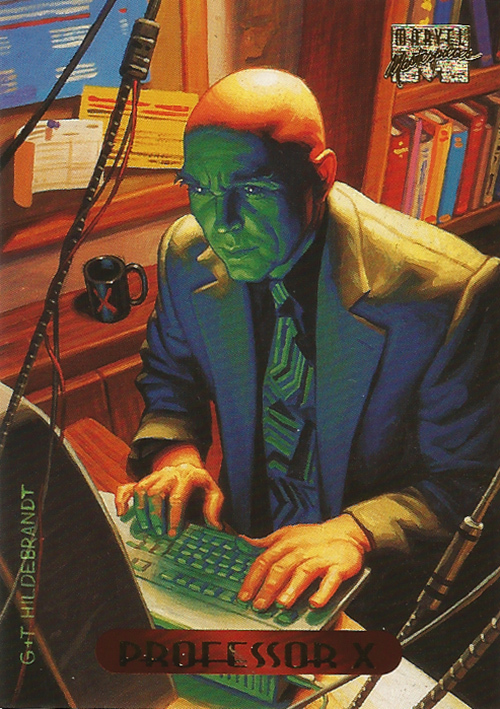 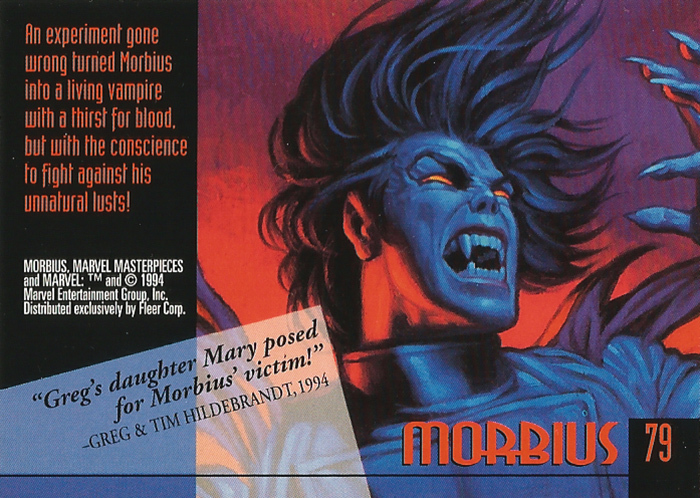 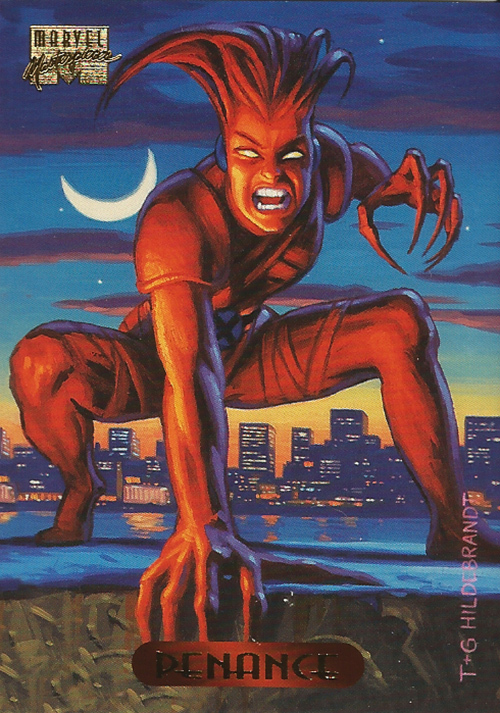 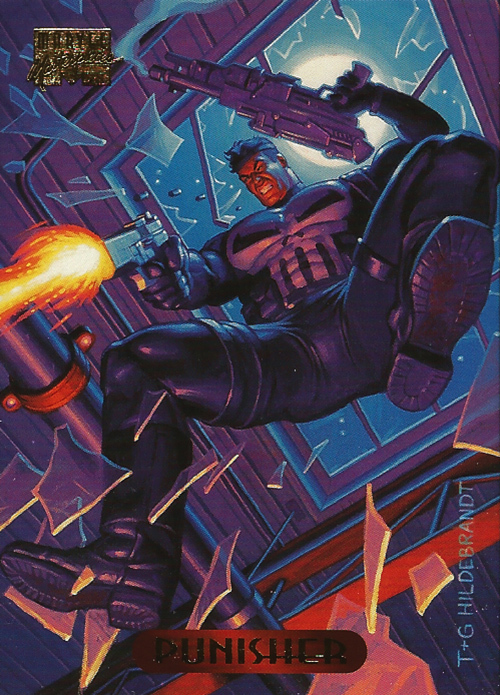 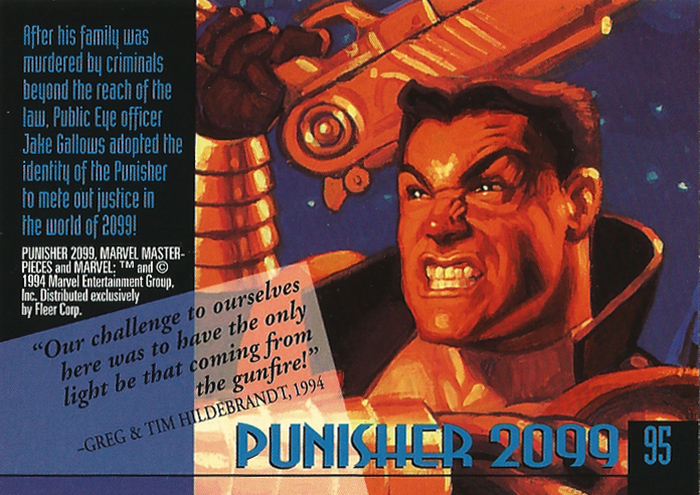 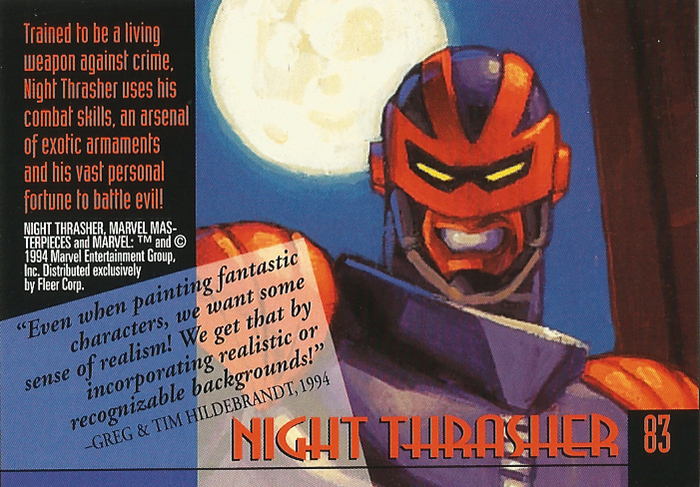 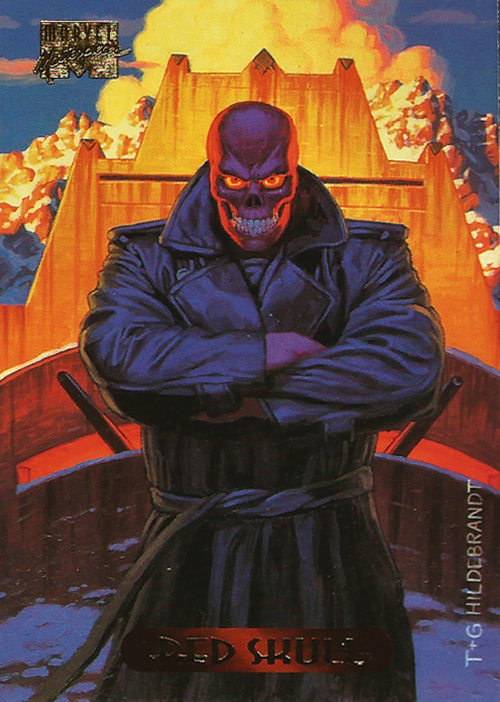 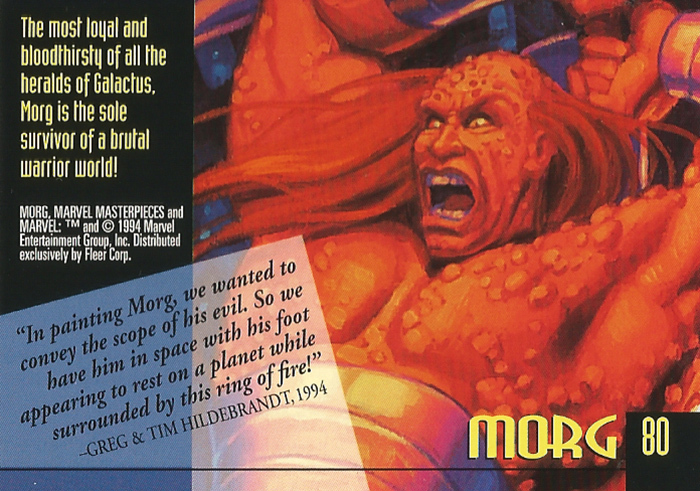 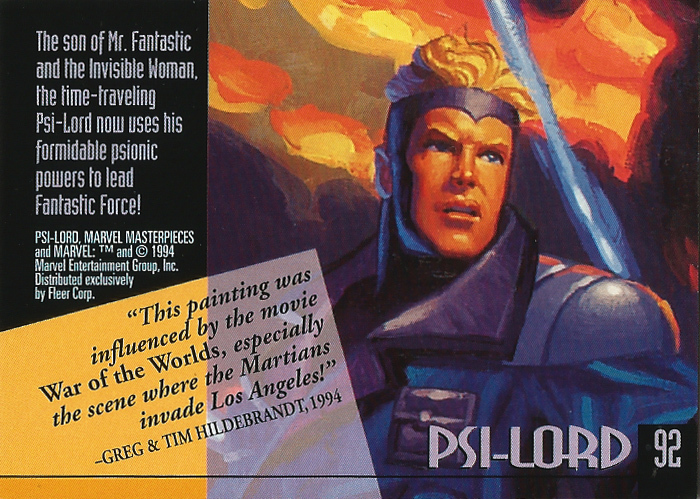 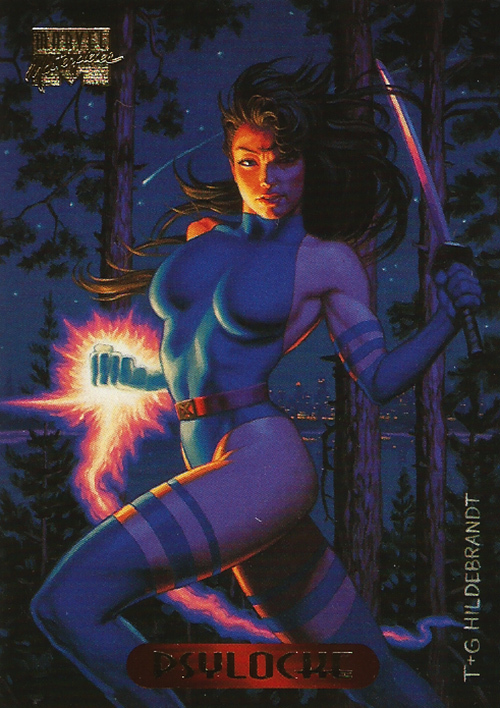 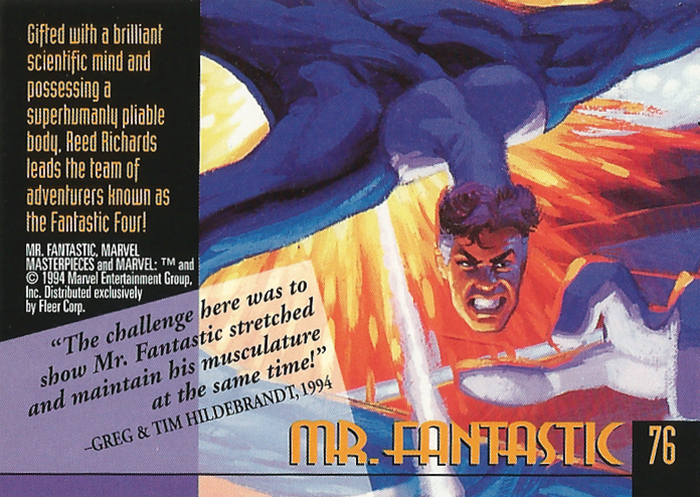 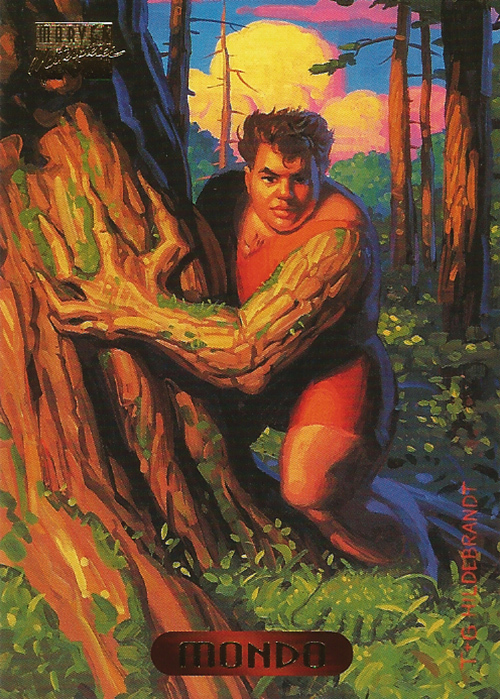 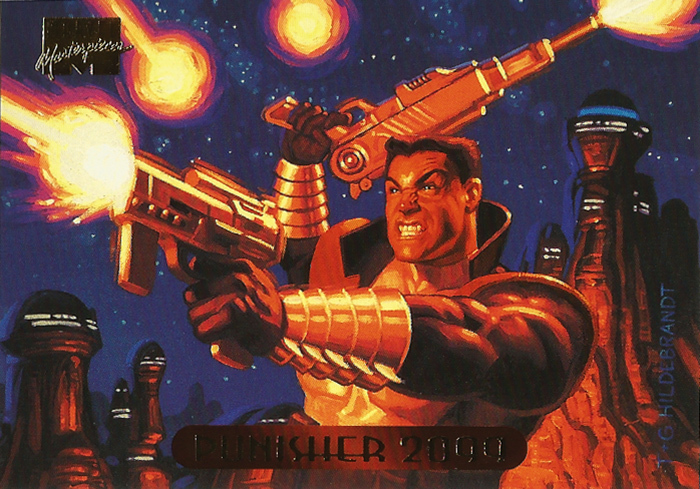 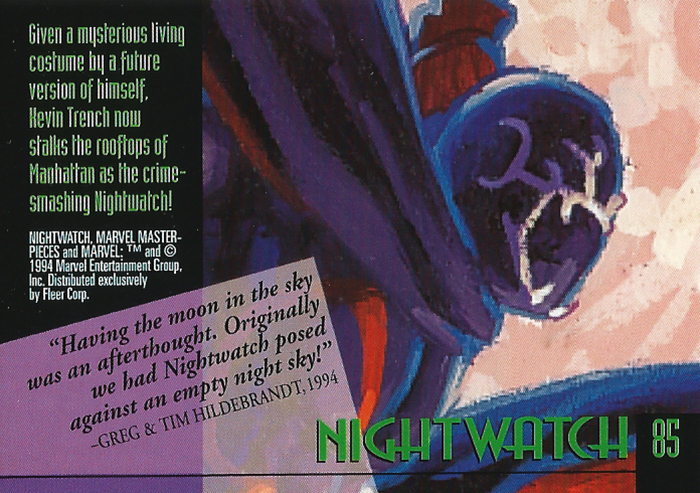 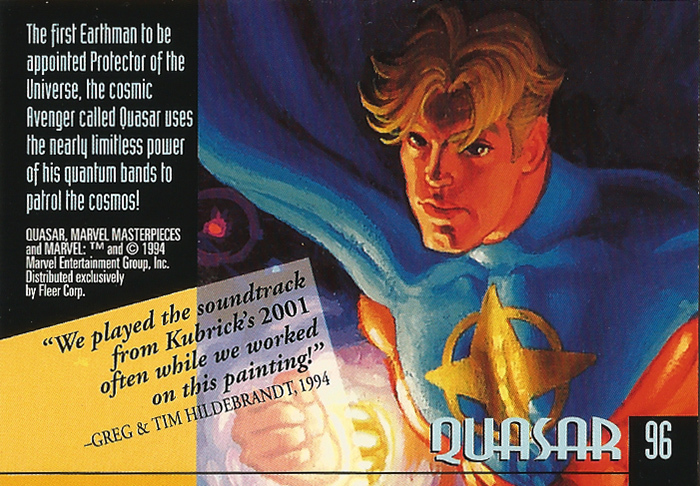 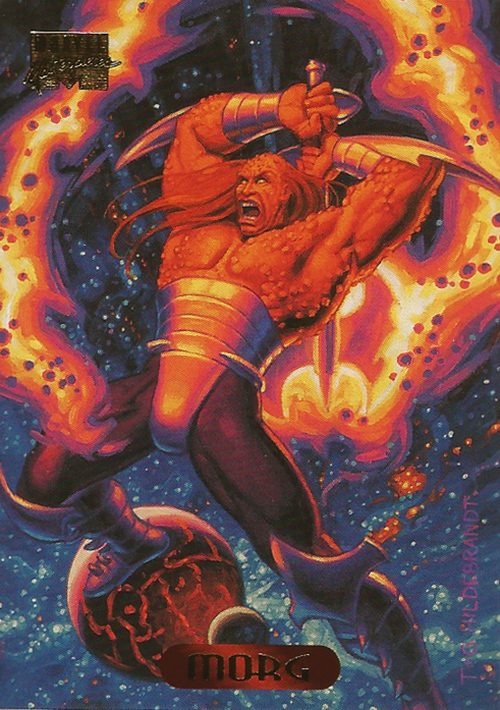 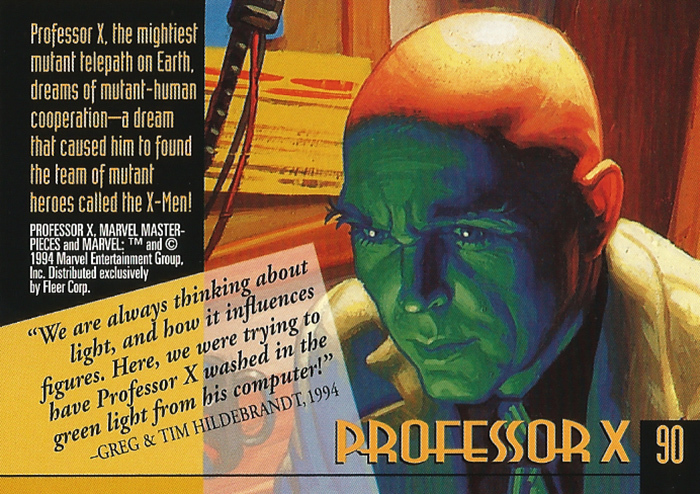 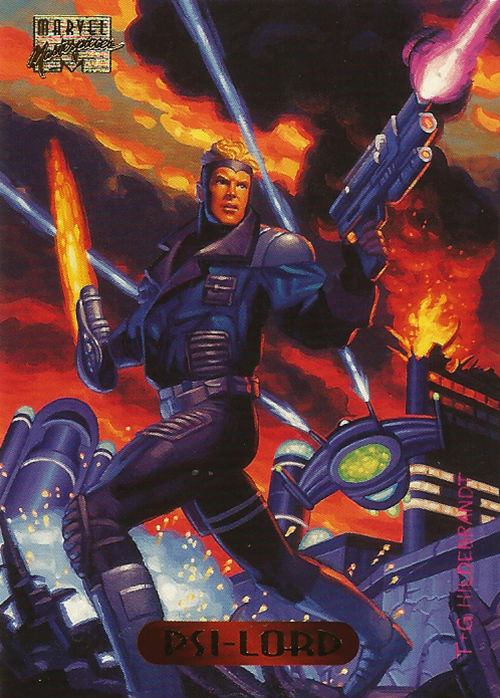 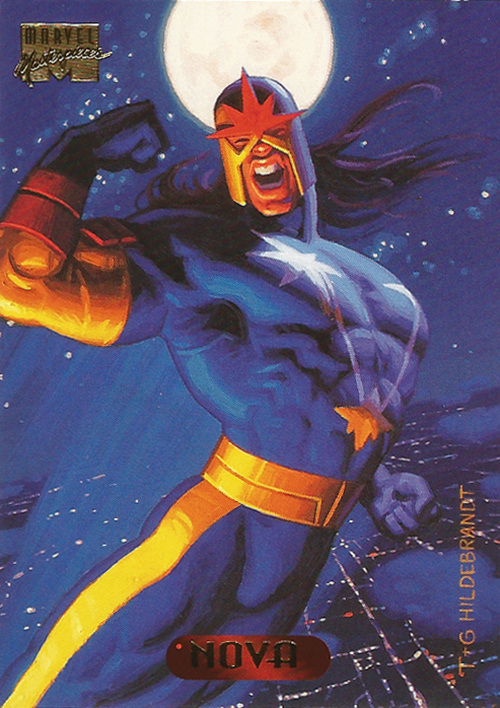 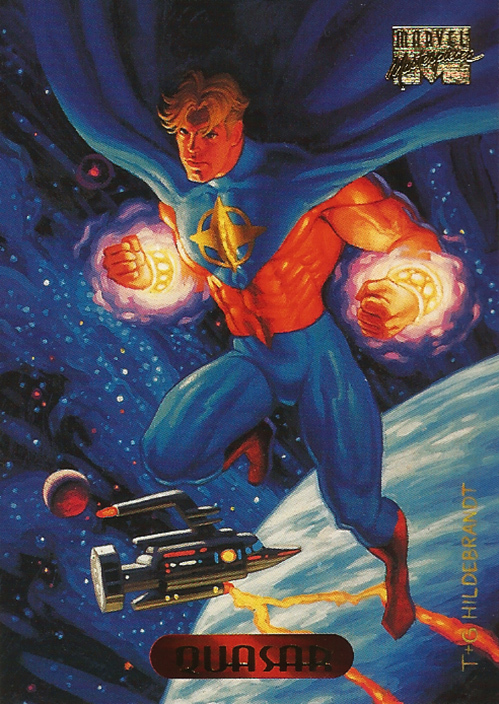 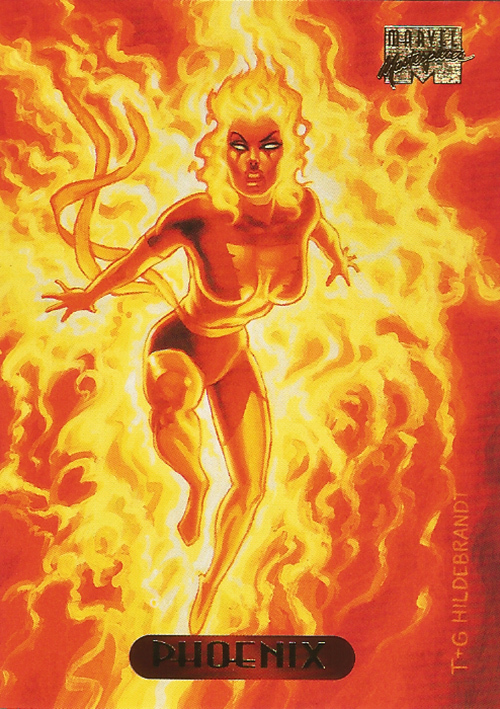 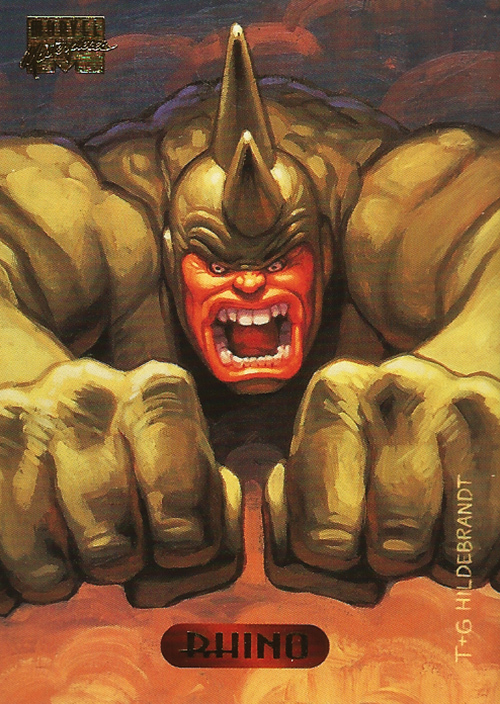 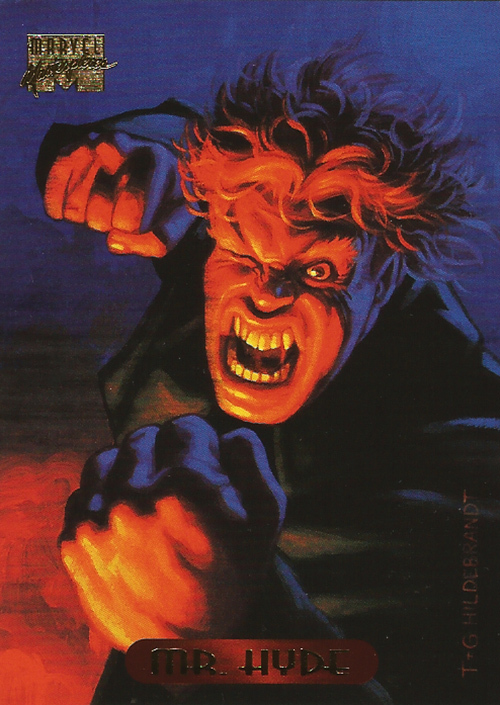 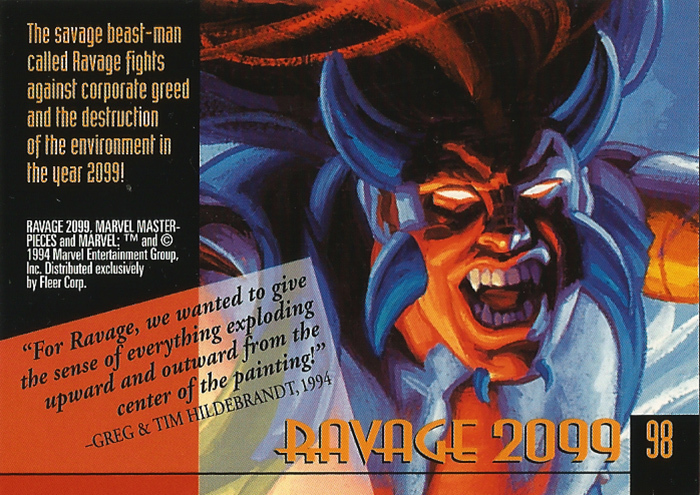 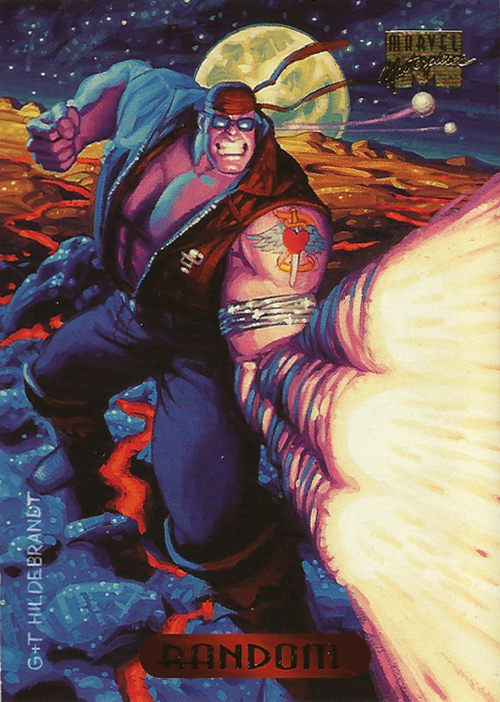 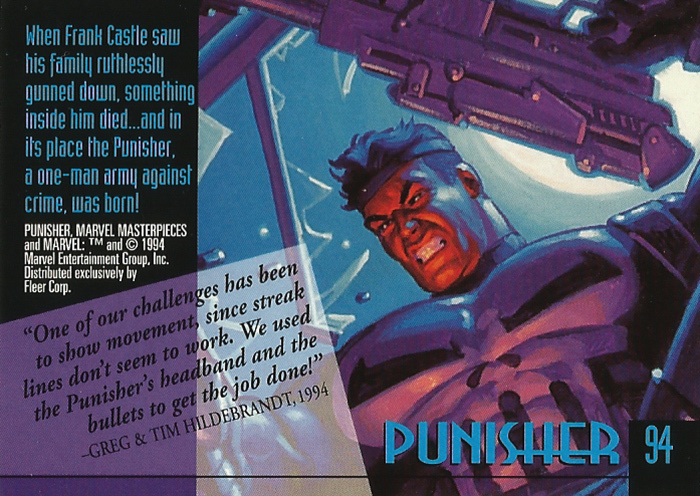 Marvel Masterpieces 1994 Edition Trading Cards by The Hildebrandt Brothers, cards #76-100 | 'TAIN'T THE MEAT… IT'S THE HUMANITY! 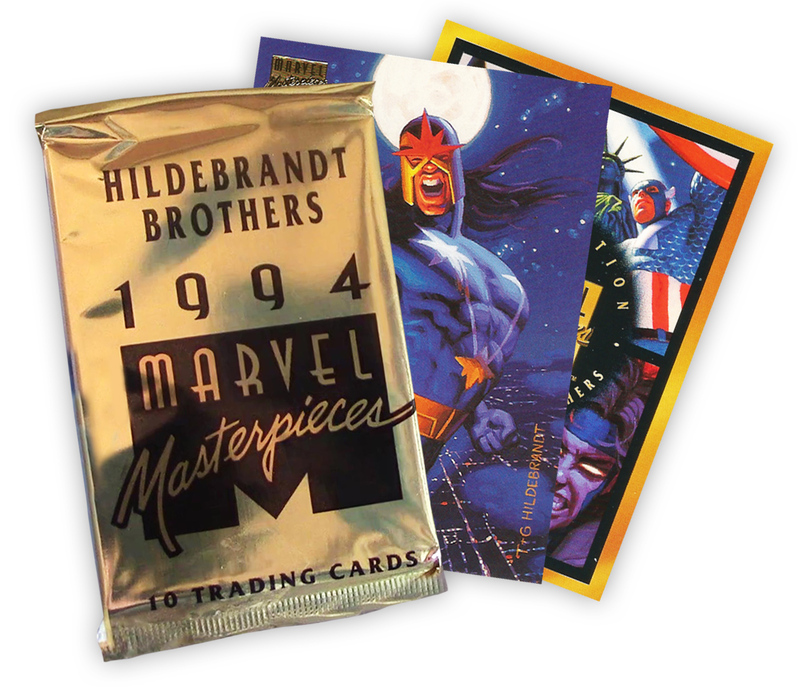 Released by Fleer the set comprised of 140 trading cards measuring 2½ x 3½ inches that shipped in blind gold foil packs of ten cards per pack. 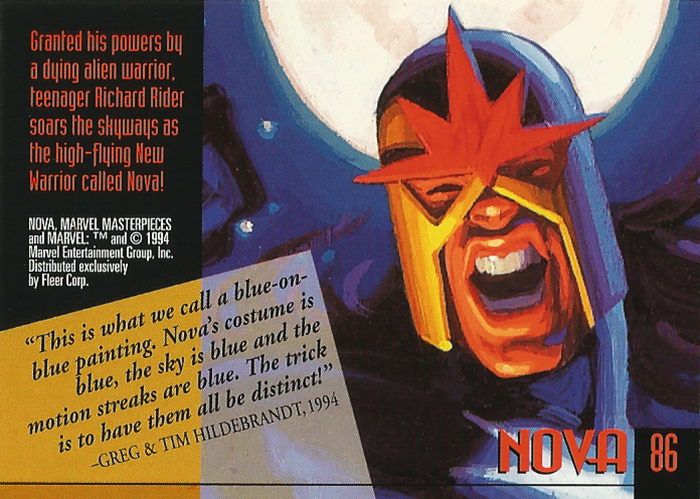 Each card featured a full-colour painting on one side (along with a gold foil logo) and on the reverse was a biography of that character and a short caption by the brothers. 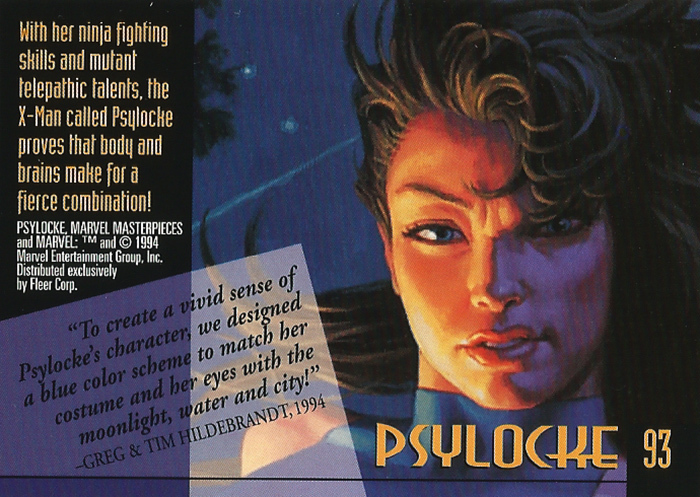 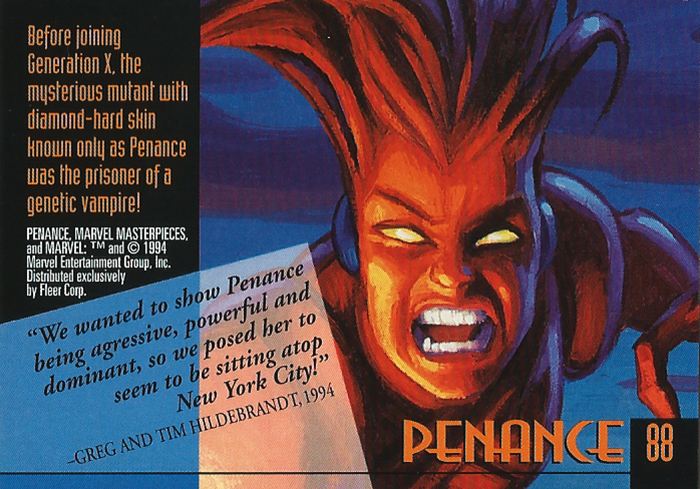 Several chase cards were inserted randomly into packs — these included gold, silver, bronze and red holofoils, as well as ‘Signature’ cards. 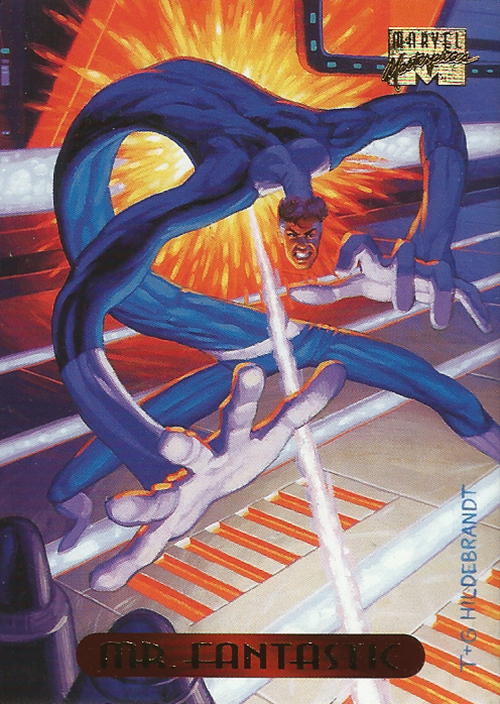 There’s some nice artwork in this batch of cards. 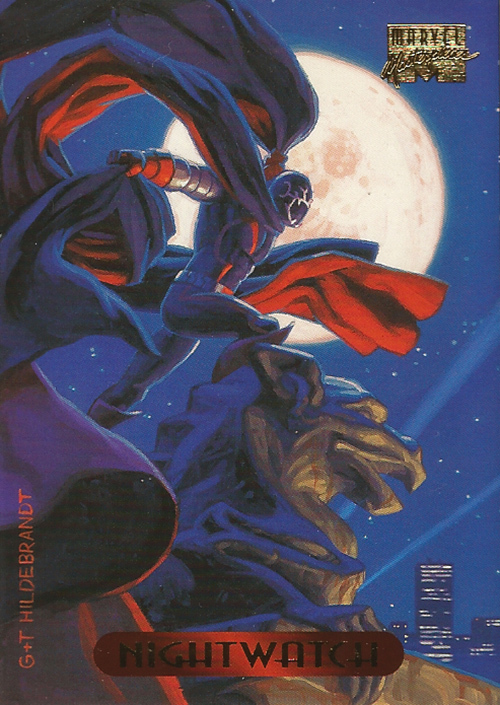 A rather dramatic Mr. 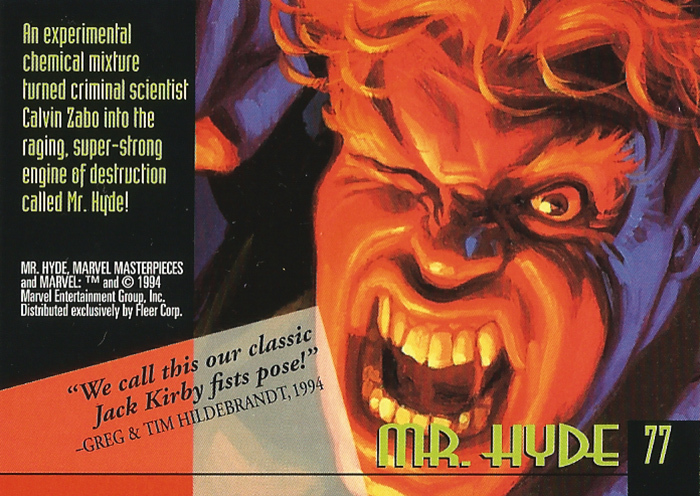 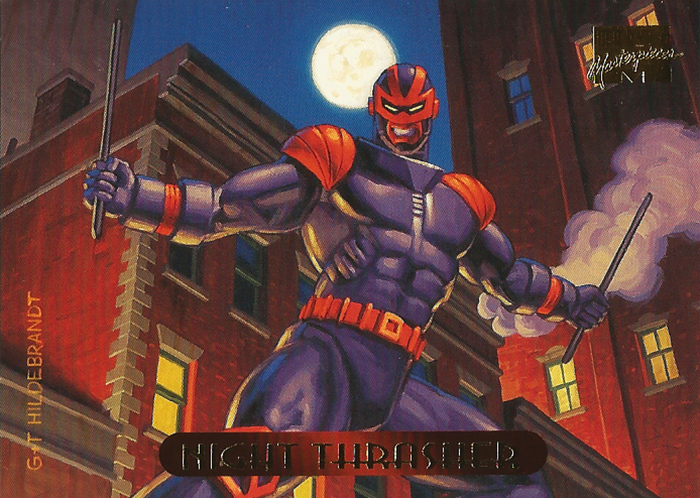 Fantastic (card#76) kicks of this batch followed by an aggressive-looking Mr. Hyde (#77). 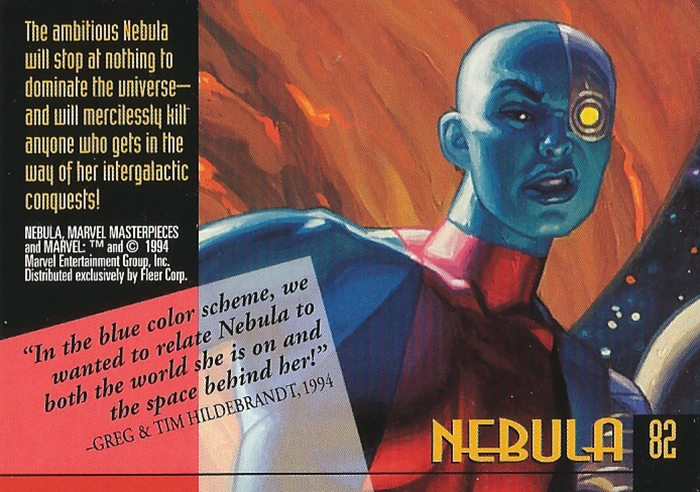 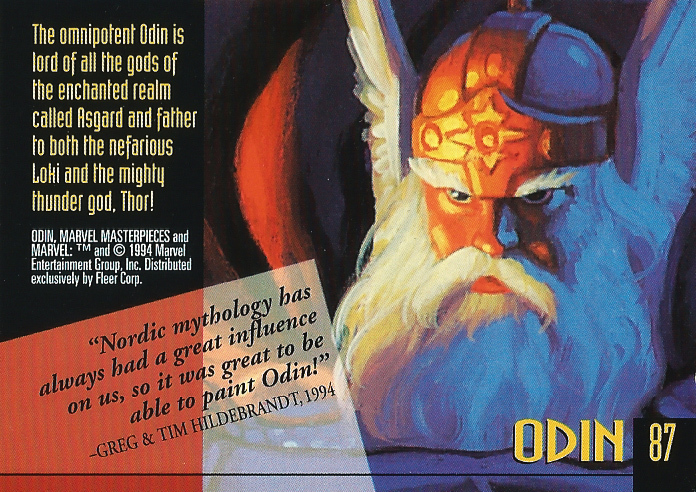 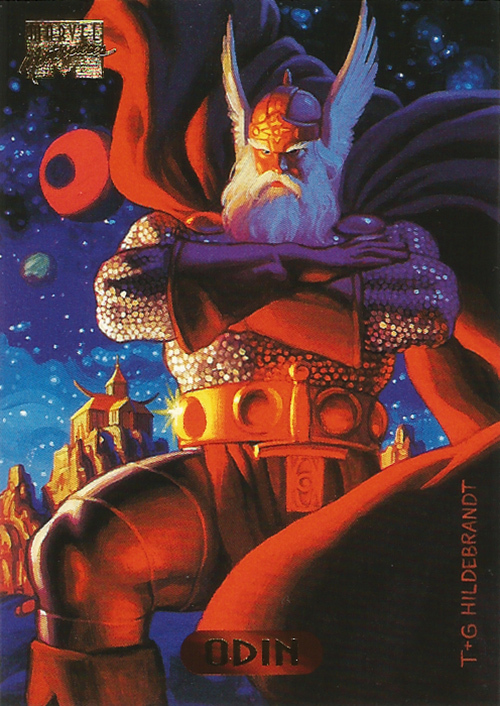 I like the eerie space-themed background to the Nebula card (#82) as well as the brooding majesty of Odin (#87). 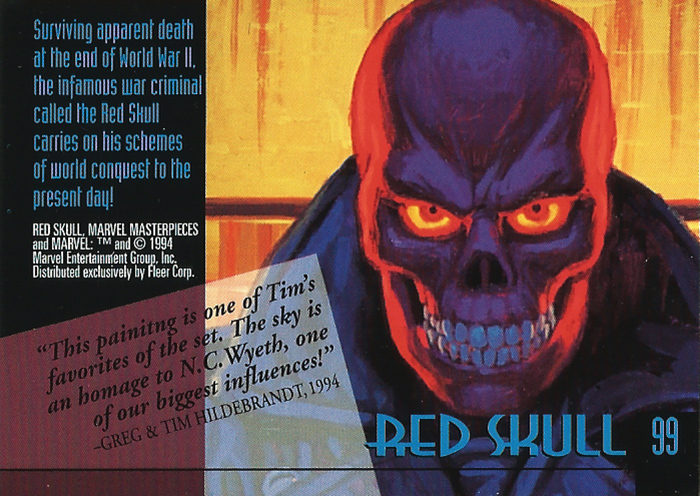 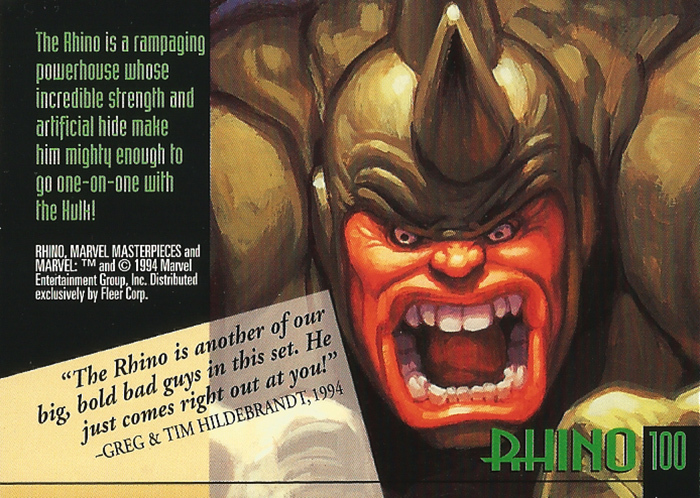 The Red Skull card is wonderfully menacing (#98), while the Rhino (#100) has a great sense of power and movement. 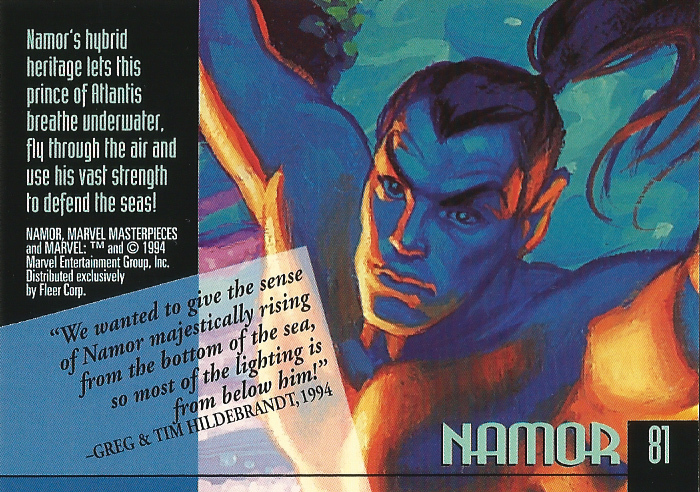 My favourite from this batch though must be Namor (#81), which is ironic has the character has never been one of my favourites. 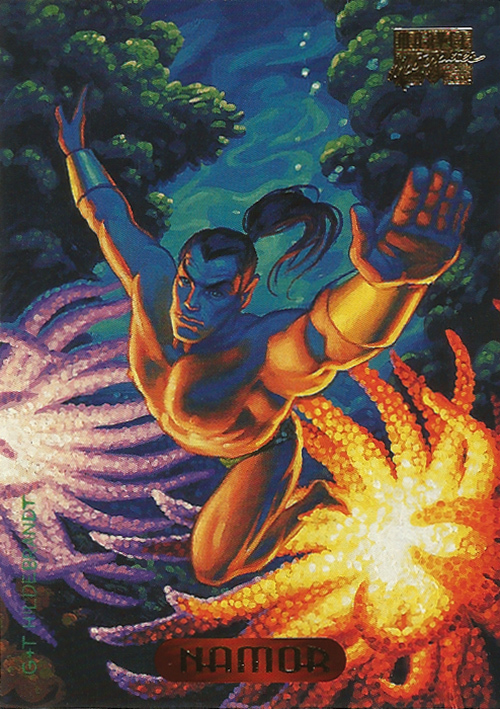 The colour work in this painting is just gorgeous however — those glowing sea anemones are wonderfully vibrant and alive. 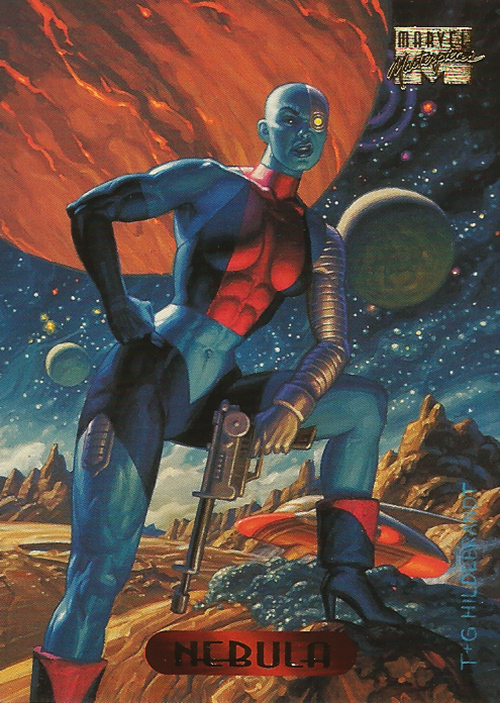 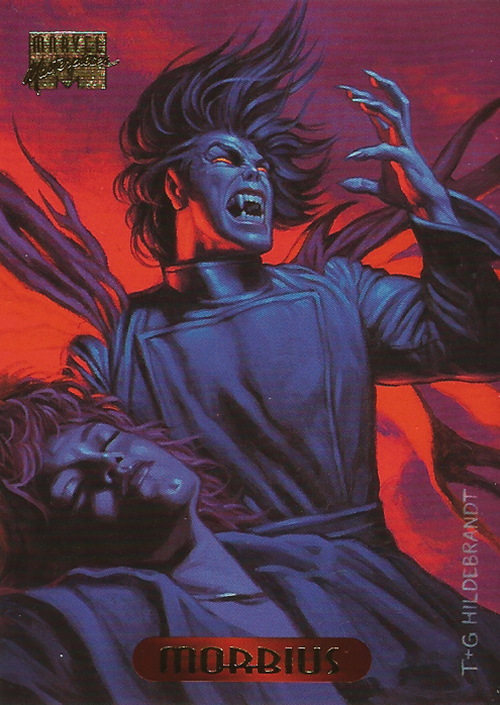 This painting really shows the Hildebrandt Brothers at their very best. 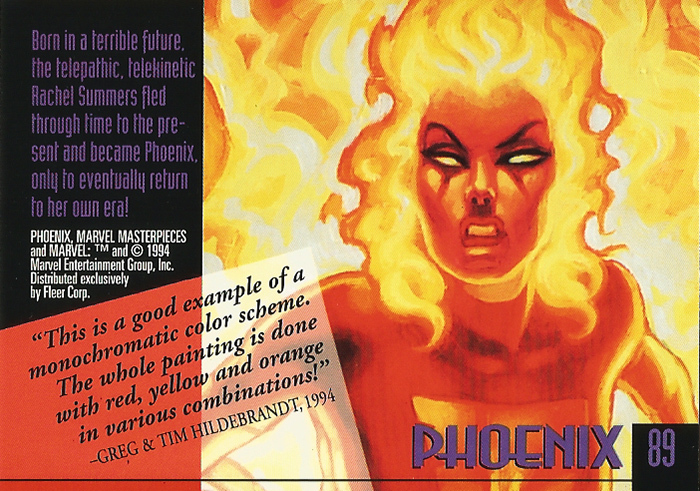 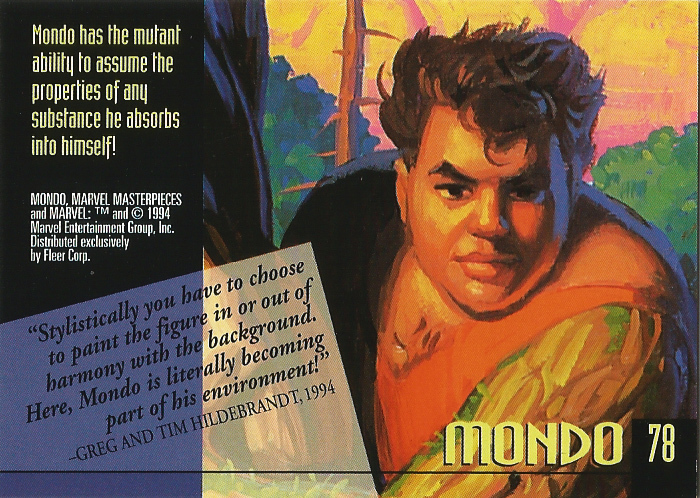 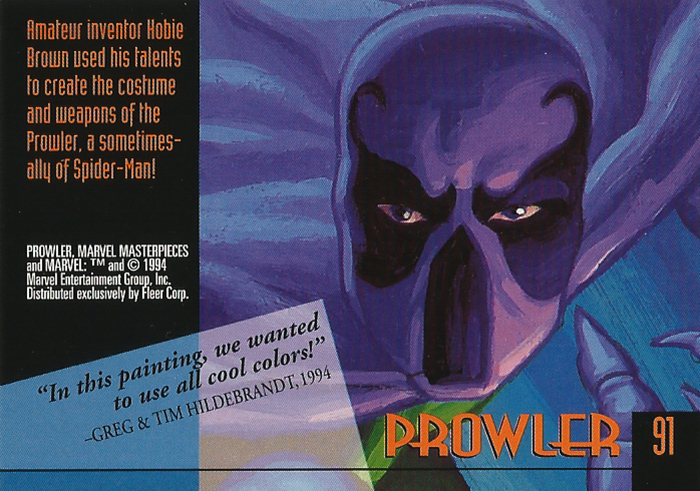 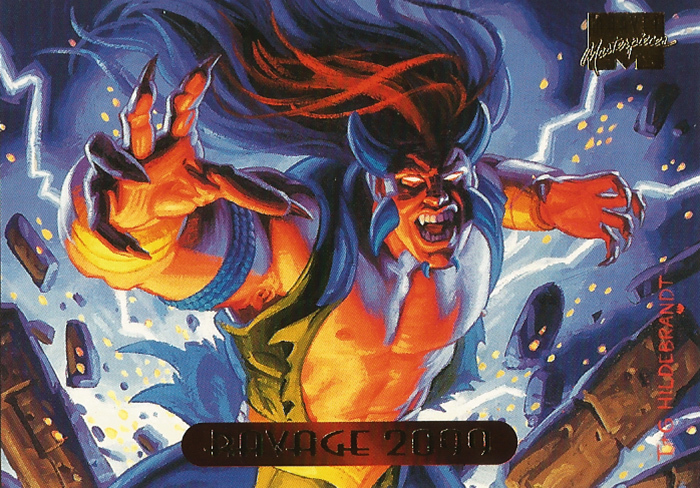 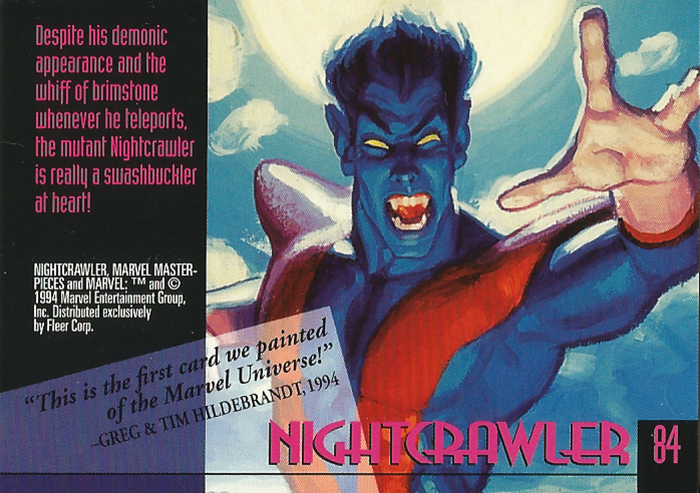 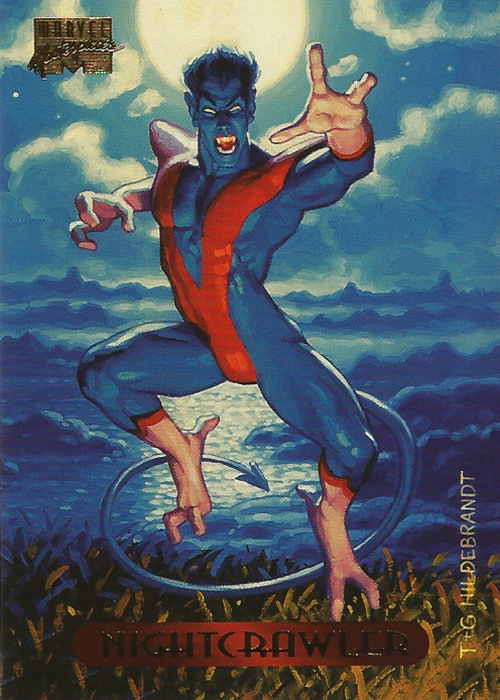 Here are cards #76-100 of the Marvel Masterpieces 1994 Edition by the Hildebrandt Brothers, both front and back. 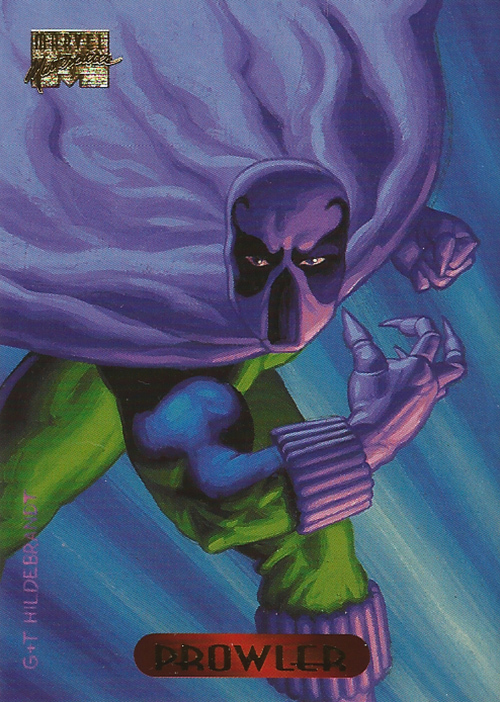 The next 20 cards are here.